While a most plain and simple religion, Methodism has incredible depth. However, unless Methodism’s practical theology is contextualized by Anglican primitivism, this point is usually missed, and something more one-dimensional is left behind. Wesley’s methodism sheds enormous light upon classical Anglican doctrine and its related treatment of ecclesiastical discipline– a fantastic case study for those who take it upon themselves. While contemporary Anglicans often look to the East to reinvigorate Christian mysticism and holiness, Methodism has already tread the path, uniquely adapted for the Anglican Way. “They were all zealous members of the Church of England; not only tenacious of all her doctrines, so far as they knew them, but of all her discipline, to the minutest circumstance. They were likewise zealous observers of all the University Statutes, and that for conscience’ sake. But they observed neither these nor anything else any further than they conceived it was bound upon them by their one book, the Bible; it being their one desire and design to be downright Bible-Christians; taking the Bible, as interpreted by the primitive Church and our own, for their whole and sole rule. In 1738 and 1744 Wesley drew up general rules for bands and classes, a combination of catholic canon and moral uplift. Public vow and consecration (setting apart) of members was necessary to join the ‘class-band’. The guiding principle was the same as St. Benedict’s– providing a structure or Rule of life for the surest way to workout one’s salvation, evidencing good fruit. Moral works required regular participation at class meetings, keeping the Sunday sabbath, partaking in weekly communion, regularly fasting, and utilizing morning prayer daily without contradiction to the established church. 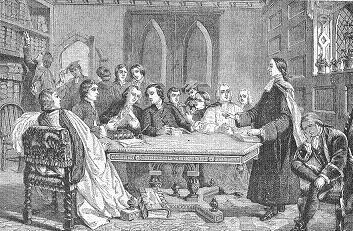 In sum, “a company of men having the form and seeking the power of godliness, united in order to pray together, to receive the word of exhortation, and to watch over one another in love, that they may help each other to work out their salvation.” The methodist society reintroduced particular confession and penance between Anglican laity, compensating, by reason of necessity, for what more puritanical worship deprived in the regular priesthood. First: By doing no harm, by avoiding evil of every kind, especially that which is most generally practiced, such as: The taking of the name of God in vain; the profaning the day of the Lord, either by doing ordinary work therein or by buying or selling; drunkenness: buying or selling spirituous liquors, or drinking them, unless in cases of extreme necessity; slaveholding; buying or selling slaves; fighting, quarreling, brawling, brother going to law with brother; returning evil for evil, or railing for railing; the using many words in buying or selling; the buying or selling uncustomed goods [without paying customs duty]; the giving or taking things on usury—that is, unlawful interest; uncharitable or unprofitable conversation; particularly speaking evil of magistrates or of ministers; doing to others as we would not they should do unto us; doing what we know is not for the glory of God, as the “putting on of gold and costly apparel;” the taking such diversions as cannot be used in the name of the Lord Jesus; the singing those songs, or reading those books, which do not tend to the knowledge or love of God; softness and needless self-indulgence; laying up treasure upon earth; borrowing without a probability of paying; or taking up goods without a probability of paying for them. It is expected of all who continue in these societies that they should continue to evidence their desire of salvation, By doing good, especially to them that are of the household of faith or groaning so to be; employing them preferably to others; buying one of another, helping each other in business, and so much the more because the world will love its own and them only; by all possible diligence and frugality, that the gospel be not blamed; by running with patience the race which is set before them, “denying themselves, and taking up their cross daily;” submitting to bear the reproach of Christ, to be as the filth and offscouring of the world; and looking that men should say all manner of evil of them falsely, for the Lord’s sake. It is expected of all who desire to continue in these societies that they should continue to evidence their desire of salvation, Thirdly: By attending upon all the ordinances of God; such are, the public worship of God; the ministry of the Word, either read or expounded; the Supper of the Lord; family and private prayer; searching the Scriptures; fasting or abstinence. …If there be any among us who observe them not, who habitually break any of them, let it be known unto them who watch over that soul as they who must give an account. We will admonish him of the error of his ways. We will bear with him for a season. But then, if he repent not, he hath no more place among us. We have delivered our own souls. Methodism was conceived as a primitive-catholic revival within Anglicanism. Wesley carefully built and restrained the methodist societies so they might resemble a sort of mendicant order within the Church of England. As such, Wesley was a kind of arch-abbot, assigning priors and inducting friars throughout the realm. This was the new Monasticism, the turning of the ‘minster abbey’ inside-out, sanctifying laity by a ‘sure Rule’ of Common Payer that Cranmer envisioned. Wesley’s (attempted) addition was to order the laity, restoring the minor offices of the primitive church. In the same way monastics dubbed their missions ‘households’, the Methodists called their chapel “Preaching Houses”. Protestants, especially Anglicans, have no bereave regarding the dissolution of the monasteries or religious life in England. The latter would be superseded and intensified by Cranmer and Wesley, holiness leaving the walled-cloister, spreading into the domestic family. Methodism is that beautiful system progressive sanctification, started by Cranmer and finished by Wesley, which builds and girds the vows churchmen given at baptism. While Cranmer was perhaps too optimistic regarding the general priesthood of common people, Wesley, I believe corrected this exuberance with ‘band-classes’, and until the break between Methodism and Anglicanism in 1784/1792, the societies were to function as a corporate and tiered organization amongst laity, hopefully under the direction of Hanoveran Bishops. The tragedy was the Bishops missed a chance to welcome and integrate the great Order Wesley had built. Yet Wesley’s reputation as a great thinker and organizer lives beyond him. When Keble later suggested lay communion as a possible reprieve against national apostasy, Keble was making a similar appeal to lay priesthood, perhaps looking upon Wesley, if not Law’s, example. The difference with non-separating Presbyterian classes, consistories (parallel vestries), and conferences that Puritans like Cartwright proposed would have been proffered conformity to Anglican standards, namely prayer book rather than directory worship. How these societies were ordered and the kind authority each layer of ministry utilized will be a future post, especially the tough question of Wesley’s odd high church principles against his creation of Superintendents. This entry was posted in Methodism, Protestantism. Bookmark the permalink. “…by those are moved with the desire of attaining life everlasting. That desire is their motive for choosing the narrow way, of which the Lord says, ‘Narrow is the way that leads to life’, so that, not living according to their own choice nor obeying their own desires and pleasures but walking by another’s judgment and command, they dwell in monasteries…” (ch. 5). Also, interesting is Benedict’s explanation of ‘certain strictness’ resulting from ‘dictates of equity’. This is the precept behind ‘teetolin’ or ‘Wesleyan covenanting’ which is equivalent to ‘evangelical vows’. The ‘dictates of equity’ is an important concept. Just like civil law, monastic may set certain strictures according to the maturity (or lack thereof), measure, and personality of men. I think the important point to make here is that such ‘counsels’ or strictures cannot contradict the commandments, but if they are legislated for a higher good then it be understood their base in ‘equity’ and ‘temporary form’ not divine right or eternal law. This is a very fundamental point to Anglicanism, how we treat aspects of tradition and scripture vs. Rome and Geneva’s method. The purpose of the Rule is that saintly fellowship better preserve us for the final destination of commune with God and salvation. Benedictine offers his rule to make us more certain of this most important reality. Yet benedict describes the rule only as a minimum aid, but for the fullness of monastic thought, Benedict points to the fathers who preceded him. It’s important to reflect the huge impact monasticism has had on christianity, even Anglicanism which defines itself by this period, i.e., first three to five centuries. But monasticism also has its built in synergistic extremes/emphases which men ought to scruple. Nonetheless, I leave two quotes. The first regarding the writings of Fathers as ‘better completing the Rule’ (yet note the purpose of the Rule remains a means by which we reach heaven) and, second, the zeal which Benedict hopes to fan.